Sage plants are garden staples, and mealy cup sage is one gorgeous type. In many garden centers, mealy cup sage is called blue salvia a reference to its scientific name Salvia farinacea. It comes in purples and whites, but it is the blue variety that attracts attention and repeat customers. Salvia farinacea is a short-lived perennial, often grown as an annual. Five years is about the lifespan you can expect from it in gardens where it grows as a perennial. Despite its unappealing common name, this beautiful Texas native flower grows into a shrubby plant with tall, sturdy spikes of flowers that repeat bloom throughout the summer. These are great as fresh cut flowers and dried flowers, too. Another big plus, they are deer resistant. Its unfortunate mealy cup name is a reference to the powdery meal or dust that covers the flower and the cup refers to the cup-like shape of the flower. As a salvia plant, it comes from a genus of plants known for its "saving" or healing properties. It shares many qualities with other members of the sage family, including the soft, fuzzy flower spikes and slightly fragrant foliage that makes it less popular with grazing animals like deer. Its leaves are elongated and slightly serrated leaves have a hint of gray to them, especially underneath. They are not fuzzy or thick, like many other sage plants. It has multiple stems of small flowers clustered along study spikes. Mealy cup sage will grow well in full sun to partial shade. In hotter climates, afternoon shade will extend the bloom period as well as the lifespan of the plant. This plant falls within USDA Hardiness Zones 7 through 11 and is reliably perennial. It is widely grown as an annual, in cooler climates, although it often survives mild winters in zones 5 and 6. Plant size varies with the variety you are growing, but most grow from 2 to 3 feet tall and get about 8 to 12 inches wide. Mealy cup sage repeat blooms from mid-summer through fall. Some varieties do not really get blooming until summer is in full swing. Salvia farinacea is not really particular about soil pH. It does, however, need well-draining soil. Mealy cup sage is fairly drought tolerant but will bloom best if watered during dry spells. You can start mealy cup sage by seed, cuttings, or divisions. In cooler climates, it is readily available as a bedding plant. Although Salvia farinacea can tolerate a light frost, it is best to start seeds or plants outdoors, after all danger of frost has passed. You can start seeds indoors, about 6 weeks before transplanting out, but they will not start blooming much earlier than plants started outdoors. Spring is also the best time to divide plants. No pinching or pruning is required to get mealy cup sage plants to branch. Sunshine will do the trick. And only minimal deadheading is required to keep the plants blooming. In rich soil, you should not need to fertilize mealy cup sage at all. If you are growing it in leaner soil, add fertilizer mid-summer, to prolong the bloom. Just be sure to keep them watered during dry periods and keep watch for pests. Although Salvia farinacea can attract aphids, mealybugs, spider mites, and whiteflies, pest problems are actually rare. With the exception of the mealybugs, you can usually control all of these pests with a few strong blasts of water. Fungal diseases may occur if the plants are grown too close together or in wet soil. Be sure to provide them with good air circulation. Strata: Two-toned with blue flowers that are cupped with white sepals. It grows to 18 inches. Because Salvia farinacea blooms so steadily, they make wonderful container plants. 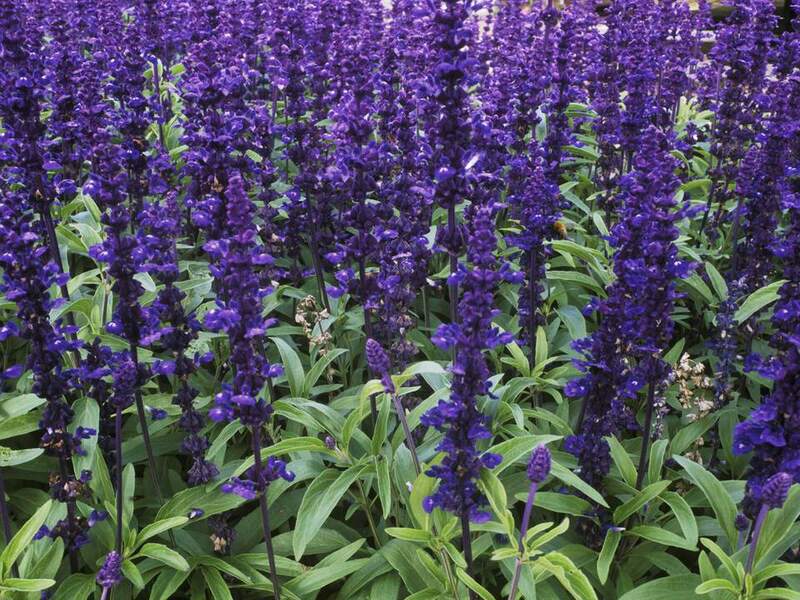 They are also the perfect solution to keeping the garden in bloom in spots where you know your perennials will be out of bloom for a brief period. Mealy cup sage is tall enough to make an impact, but the roots will not interfere with nearby plants. The bluish purple color really shines and provides great contrast next to pale yellows like coreopsis "moonbeam" or the buttery yellow flower carpet rose. It is also a great way to blend oranges into your garden and for tempering harsh, red tones.